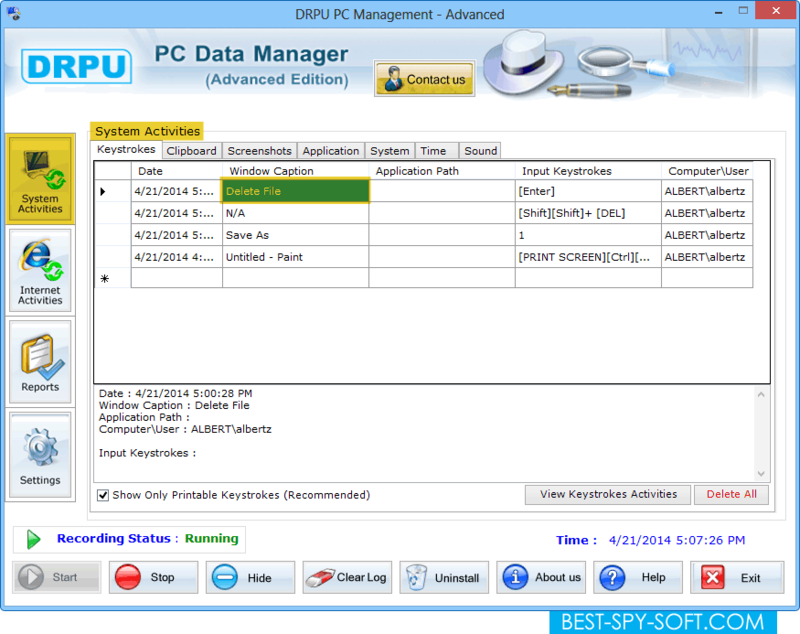 Advanced keylogger software records system and internet activities in stealth mode. 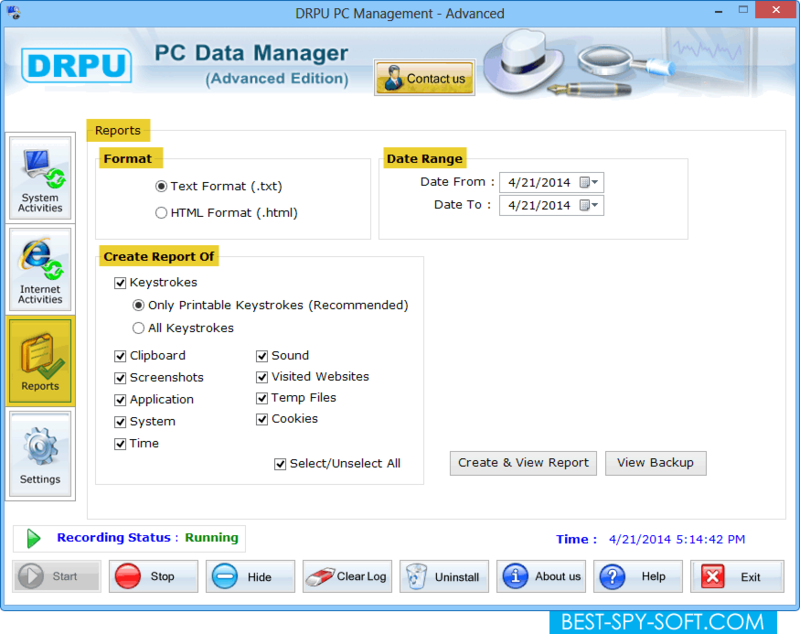 Key logger Software also generates all keystrokes in text or html file formats. If you run the software first time after installation then by default the monitoring status of the application will be in running mode. How to monitor System Activities using computer monitoring software ? 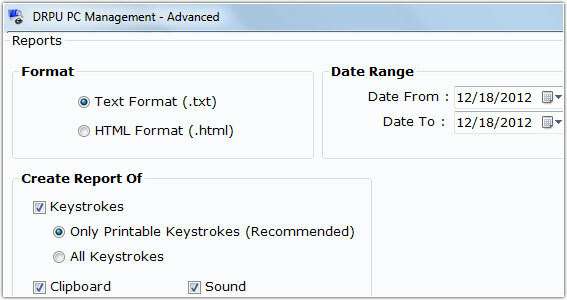 Date: To display date and time of pressed keys. Window Caption: To display title of application this is being used. Application Path: To display path of accessed application where it exists. Input Keystrokes: To display typed keystrokes. Computer/User: To display computer name and its user name. View Keystrokes Activities: To view current keystrokes activities in txt format. Delete All: To delete current records of keystrokes activities. Date: To display date and time when the screenshot is captured. Window Caption: To display title of application whose screenshot is captured. Application Path: To display the path of that application whose screenshot is captured. File Path: To display path of captured screenshot where it is automatically saved. Delete All: To delete current captured screenshots (as appears in the grid). View Screenshots Activities: To view current screenshots activities in txt format. Open Folder: To browse the backup path of recorded screenshots. Slide Show: To view screenshot, double click on the record or click on “Slide Show” button to view screenshots on sliding window. By default sound settings will be disabled. If you enable sound recording settings (while no voice chat or any communication device connected) then default sound clips will be created in every five minutes until the specified clips size achieves. 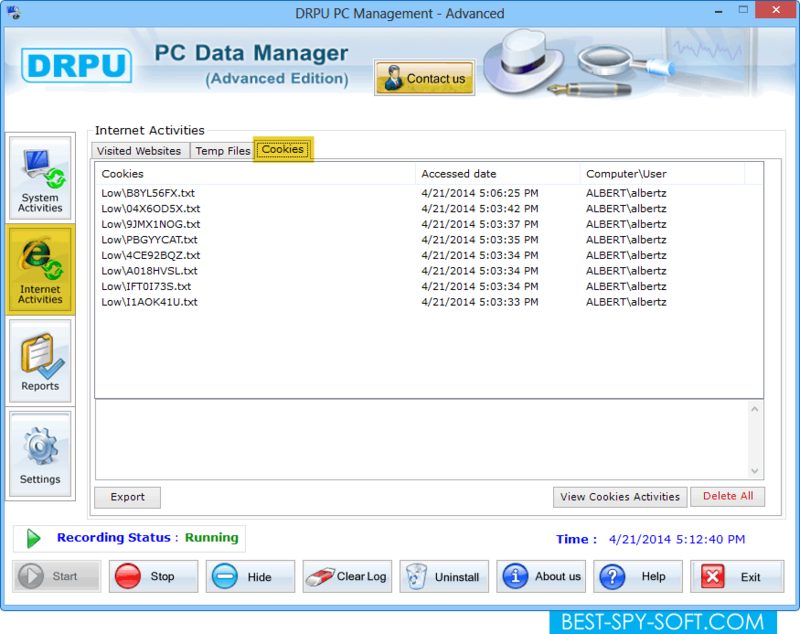 How to monitor Internet Activities using internet activity monitoring software ? URL: To display URLs of visited websites. Accessed Date: To display date and time of visited websites. Computer /User: To display the computer name and its user name. Export: To export details of visited websites in excel format. View Visited Websites Activities: To view visited websites activities in txt format. Delete All: To delete the records of currently visited websites. 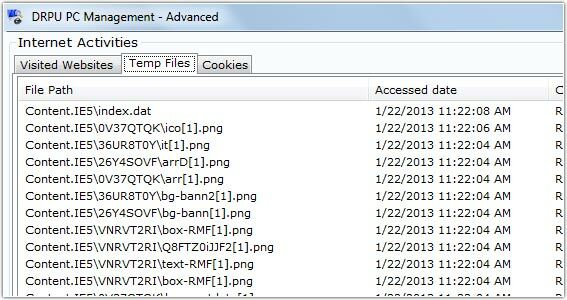 How to monitor Temp Files Activities ? Temp files are the cache of web browser this means when you load the web page with internet browser, it is saved on your computer so that if you later decide to open the same page again, it will open a lot faster. Programs create temporary files primarily for backup purposes. File Path: To display temp files of visited websites. Computer\User: To display computer name and its user name. How to monitor Cookies Activities ? Cookies are used to store entered information into a form so it does not need to be reentered on subsequent visits. Cookies: To display cookies of visited websites. Accessed Date: To display date and time when cookies are created. How to generate Reports using computer monitoring software ? Format: To generate report of recorded data in either Text (.txt) or HTML (.html) file format. Date Range: To select the date range to generate the report. Create Report Of: You need to click on the check box to create the report of the internet activities like keystrokes (only printable keystrokes, all keystrokes), clipboard, screenshots, application, system, time, sound, visited websites, temp files and cookies. After specifying all the parameters, click on “Create and View Report” button to create and view the report. A Save As window will be appeared in which you need to specify the path and name to save the report. You can create the report of only those records which are currently appeared in the grid. You can view backup of previous records by clicking on "View Backup" button. 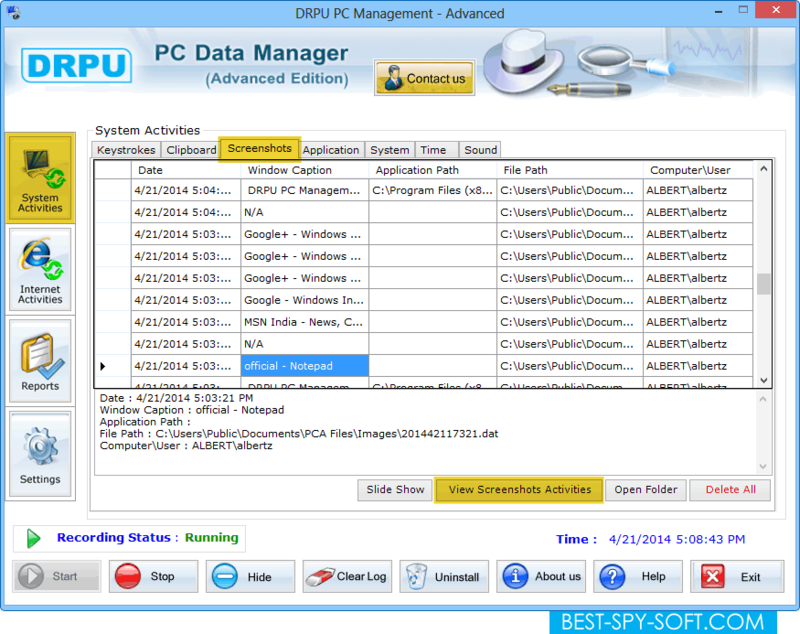 How to monitor Backup Activities using key logger software ? Clear Backup: To permanently delete the records from backup folder. Create & View Report: To create report of backup which is currently appeared in the grid. Back: To return on Reports Window.